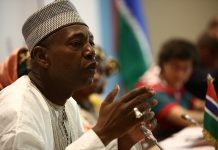 The information that reached the office of the Majority Leader on the revocation of the nomination of Hon Ya Kumba Jaiteh which soon found itself all over in the social media; with some referring to it as sacking or dismissal of a sitting member of the National Assembly by the President of the republic of the Gambia Adama Barrow. This is a very unfortunate action by the president of the republic. The very unusual thing about the letter said to have come from the office of the President which was signed by the Secretary General and Head of the Civil Services Ebrima .O. Camara was that the text of the letter was not on any government letter head. Very unusual and one would even wonder if that was an official communication from the office of the President. The text was just on an ordinary A4 paper with no stamp; strange is it not? The letter’s reference is PR/C/66/Vol/ (66-EOC). The content of the letter reads: I here-by write to convey Executive decision to revoke your nomination as National Assembly Member, with immediate effect .By copy the Clerk of the National Assembly is here-by duly notified. The irony is that the letter is dated 25 February 2019 and information was received since the 21 February 2019. Was the letter written on or before the 25 February 2019? Where the President or his Advisers got it all wrong is that the President’s power stops at nomination stage and not approval stage. It is not when the approving authorities already approved and the status of the nominated person change from nomination to a member of the National Assembly that the President can assert authority. It’s wrong and unconstitutional of the president to act the way he acted. The constitution is clear on how one can become a member of the National Assembly; which is either by election or nomination of candidates by the President subject to the approval of the members of the National Assembly. The constitution is also clear how a sitting member also vacates his or her seat at the National Assembly. Not a mention of revocation of nomination is in the constitution as way of one losing his or her seat. So how can the President’s pronouncement of revoking nomination hold water? Where the President got it all wrong is that his powers only stops at nominating, once we pass the nomination stage the person becomes a member of the National Assembly and full stop. The President then has no powers at all to remove a member of the National Assembly. No matter how the member becomes a member of the National Assembly. It is rather the other way round, that is, it is the members of the National Assembly who can impeach a President. The power to dismiss a President lies in the hands of members of the National Assembly but not the President dismissing members of the National Assembly. Is the President ignorant of the laws and if he is where is his legal advisers? How then can the President be allowed to write such a letter or agree for such letters to emanate from the Office of the President. Mr. President Nominations and appointments are two different things; you only nominated but never appointed Hon Ya Kumba Jaiteh to the National Assembly. She is not a civil servant and cannot sack her.